For a paper published in any venue during the previous calendar year (2017) that shows significant potential to advance the field of Artificial Life. Martin gave an invited keynote lecture at ENABLE, Barcelona, November 2017. 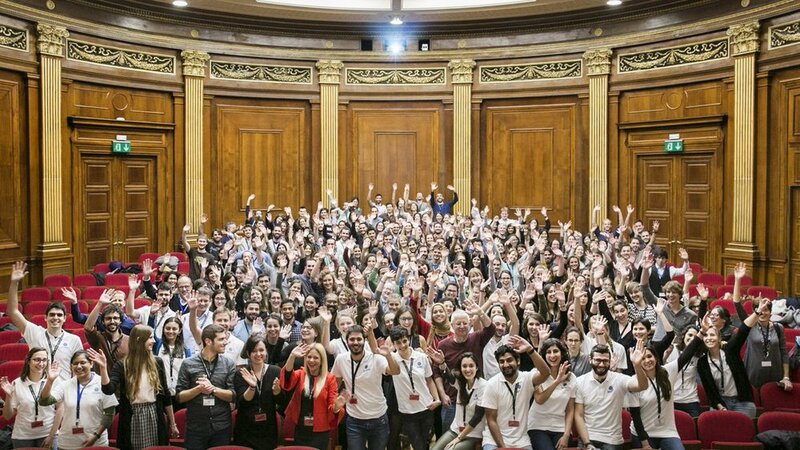 ENABLE is the first European symposium organized solely by PhD students and postdoctoral fellows. The Evobliss Triple Autumn School took place in Copenhagen on October 2-6, 2017. The participants had the opportunity to learn about different topics of the Evobliss project: liquid handling robots, microbial fuel cells and artificial chemical life. 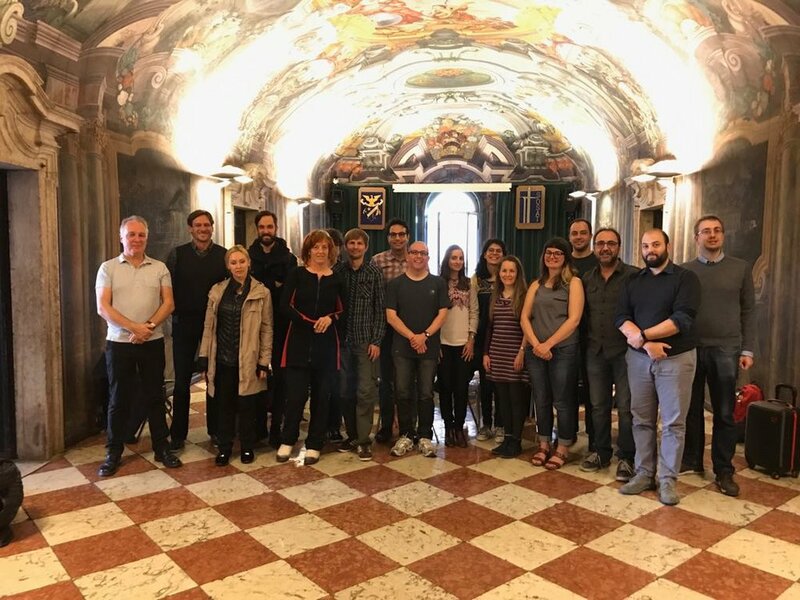 Recently we participated in our European project meeting in Venice on Living Architecture. And then again we met in Madrid at the Spanish National Research Council (CSIC) with a hands-on workshop in synthetic biology. Our Living Architecture project has been mentioned in the news! Jitka Čejková presented a poster titled Shape changing multi-armed droplets by Jitka Cejkova, Martin M. Hanczyc and Frantisek Stepanek at ALIFE 2016 conference and she won the best poster award! Martin participated in the annual innovation and brainstorming workshop at ECCO leather called Hot Shop. Pint of Science in Trento (Italy) – Martin Hanczyc had a talk about Artificial Biology . The fifth EVOBLISS consortium meeting took place on 2nd and 3rd of May 2016 and was hosted by Karlsruher Institut für Technologie (Karlsruhe Institute of Technology, KIT), Germany. Living Technology (LIAR) - New European Project started! Living Architecture (LIAR) is a modular bioreactor-wall, which is based on the operational principles of microbial fuel cell technology and synthetic ‘consortia’ of microbes. LIAR is conceived as a next-generation selectively-programmable bioreactor and integral component of human dwelling, capable of extracting valuable resources from waste water and air, generation of oxygen and production of proteins and fiber by manipulating consortia performance. Its operational principles are grounded in distributed sensing, decentralized autonomous information processing, high-degree of fault-tolerance and distributed actuation and reconfiguration. Applications within urban systems are examined as a form of customizable micro-agriculture for installation in domestic, public (schools, hospitals) and office environments. Such a system has far reaching impacts on the building performance (resilience, resource recycling) manufacturing and design with ecosystems. • Foundational concepts through which ‘designed’ metabolisms can computationally process, recycle, remediate and synthesize valuable compounds from waste water. • Transferable principles by which synthetic ecosystems can shape the environmental performance of our living spaces to increase our health, productivity and ecosystems impact. • New standards for synthetic ‘ecosystems’ through consortia design, engineering and optimization. All CIBIO laboratories moved from Mattarello to Povo in the end of October. Our group is now working temporary in Blue 5 and we are looking forward to the new lab Orange 5 that we will share with Mansy group. Martin, Jitka and Silvia participated in the fourth EVOBLISS consortium meeting that took place from Monday 2nd to Wednesday 4th of November at University of Western England, Bristol. Droplets 2015 conference (6-8 October 2015) at University of Twente (The Netherlands) hosted a video contest. Jitka Cejkova with Martin M. Hanczyc submitted this cool movie about chemotactic and shape changing decanol droplets. Jitka presented also her Evobliss work titled“Experimental study of decanol droplets behavior in the presence of decanoate and salt”. Martin is an instructor in the project UNITN-Trento iGEM. UNITN-Trento iGEM team 2015 has a wonderful idea to change the way people think about Microbial Fuel Cells. We attempted to improve the MFC platform by exploiting the power of the sun and the versatility of E. coli, so we added new interesting features to build a “Solar pMFC”. Check out the UNITN-Trento iGEM web! Welcome in the new academic year 2015/2016!